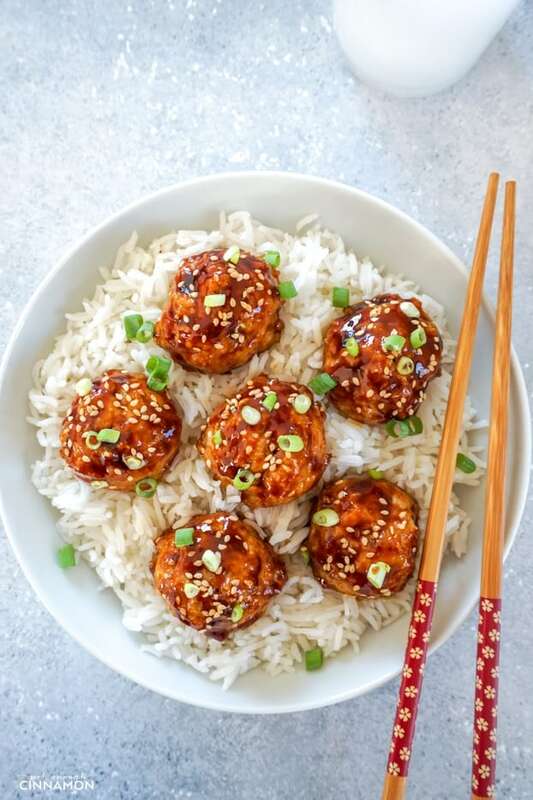 Baked Asian glazed meatballs made with ground chicken, oats and a little bit a Sriracha + a killer sauce. Perfect as an appetizer or a main meal with rice or cauliflower rice! They are great for meal prep, too. Gluten free. Bake for 30 minutes at 400F / 200C degrees. While the meatballs are cooking, prepare the glaze. Use a large pot so you can transfer the meatballs and cover them in sauce when they’re done cooking! 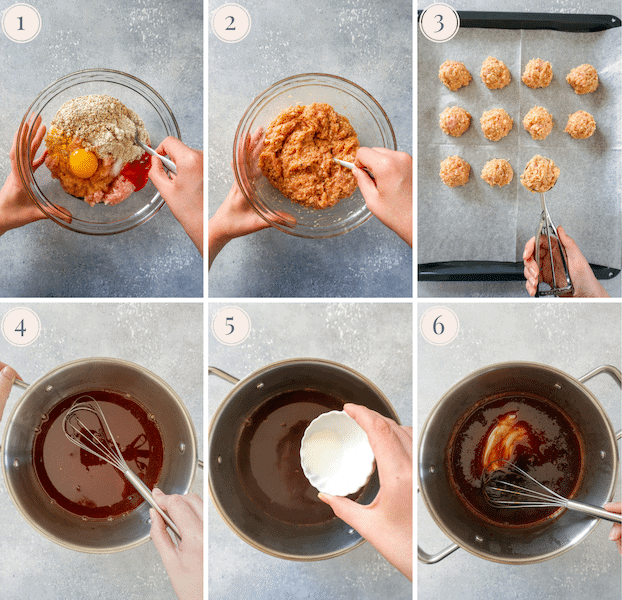 When the chicken meatballs are baked and golden (step 7), transfer them to the pot with the sauce and mix with a spoon to get them all well covered with the sauce (step 8). Sprinkle with scallions and sesame seeds, and voila! 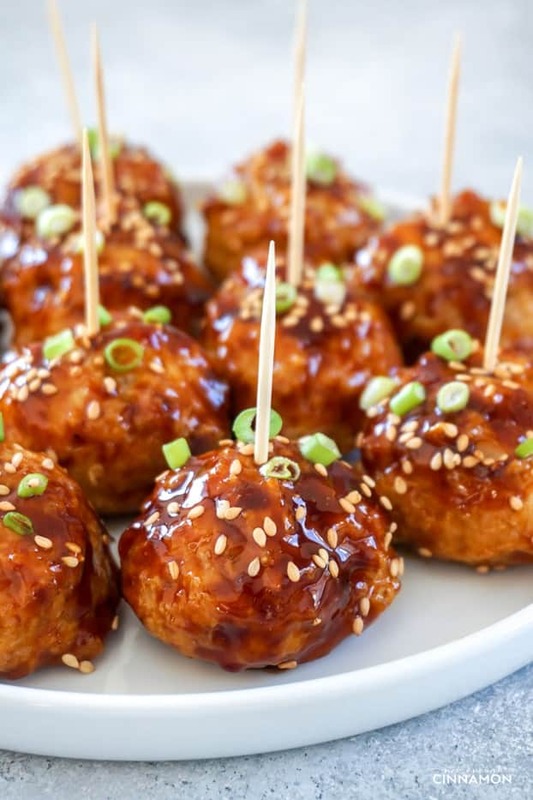 You can serve them at a party as an appetizer, with toothpicks for easy picking or as a main dish, served with rice, cauliflower rice and/or veggie stir-fry. I prefer them warm, but these meatballs can also be eaten cold! Make sure to use low sodium or reduced sodium soy sauce or the sauce will be too salty. To make the sauce, use a pot that’s big enough to fit all the meatballs so you don’t have to dirty another dish to mix the meatballs and the sauce. No chicken? No worries! You can use lean ground beef or turkey instead. 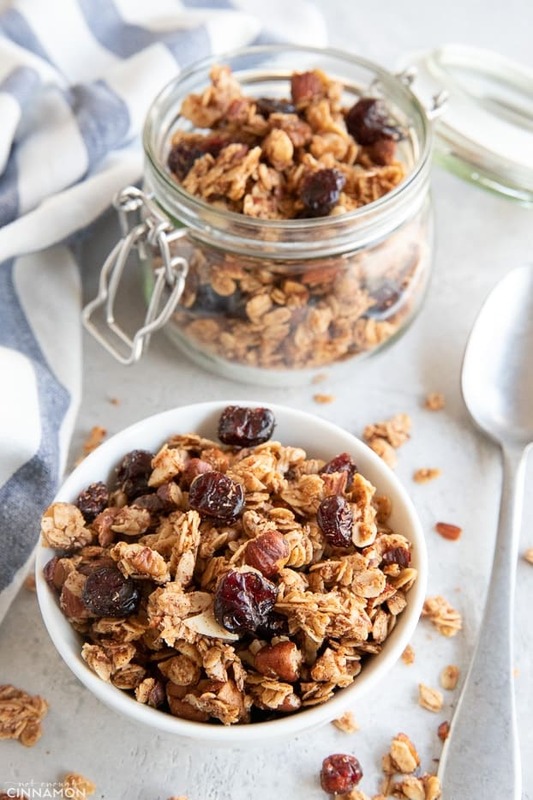 Make your own oat flour! Pulse some oats (quick or rolled) in your food processor or blender until fine and that’s it! They freeze really well. Either cooked with the sauce, or raw without the sauce. See all the freezing instructions below. 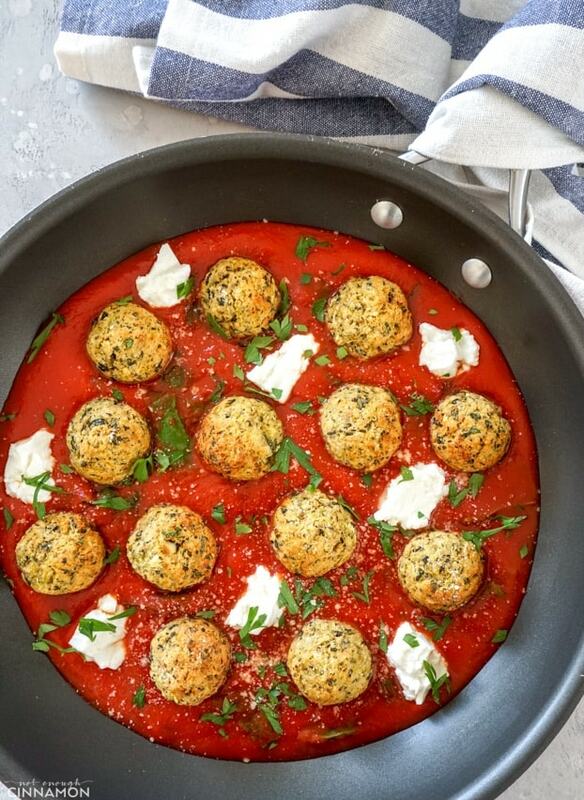 If you tried these meatballs, don’t forget to rate the recipe below and let me know how it went in the comments – I love hearing from you! You can also follow me on Instagram, Pinterest and Facebook for more deliciousness and behind-the-scenes! Preheat oven to 400F / 200 C degrees. Line a baking sheet with baking paper. In a large bowl, mix all meatball ingredients (chicken, garlic, egg, oats, oat flour, sriracha and salt) until well combined. 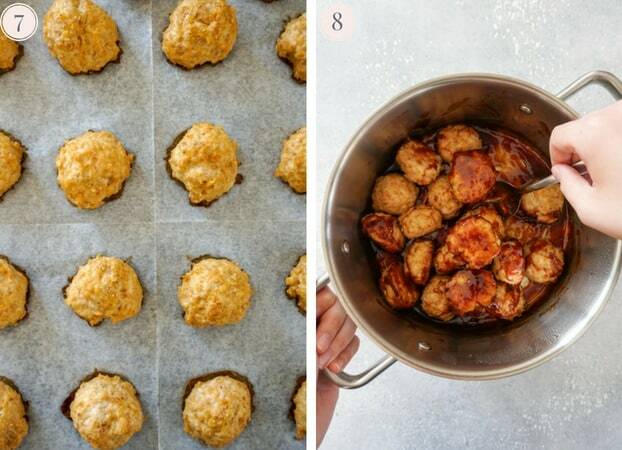 Using an ice-cream scoop or your wet hands, form meatballs about the size of a gold ball and place on prepared baking sheet. You should get about 20 meatballs. About 10 minutes before the meatballs are finished baking, prepare the sauce. In a large pot, whisk together all sauce ingredients except cornstarch (soy sauce, rice wine vinegar, orange juice, sriracha, honey and ginger). Bring mixture to a boil and cook for about 1 minute, whisking often. Stir in dissolved cornstarch and cook, whisking often, for about 2 minutes or until sauce thicken. Remove from the heat. Transfer meatballs to the pot, and stir with a spoon to cover the meatballs with sauce on all sides. Serve as appetizers with toothpicks or as a main dish with rice or cauliflower rice. Sprinkle with sesame seeds and scallions, if using. Oat flour: make your own oat flour by pulsing some oats in your food processor or blender until fine. Soy sauce: make sure to use low sodium or reduced sodium soy sauce or the sauce will be too salty. Meat variation: you can also use lean ground chicken or ground turkey. To make the sauce, use a pot that's big enough to fit all the meatballs so you don't have to dirty another dish to mix the meatballs and the sauce. 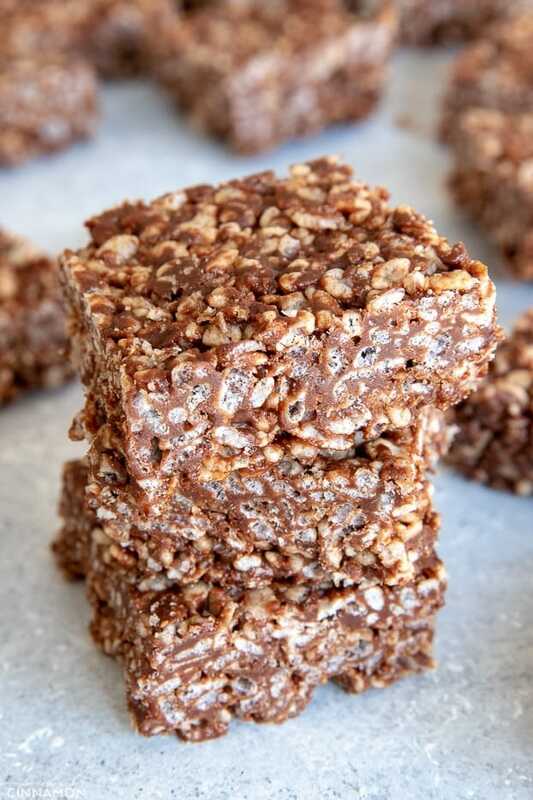 They are perfect to make ahead as they keep well in the fridge for up to 4 days. Place the cooked meatballs covered in sauce in an airtight container and freeze for up to 3 months (they will still be safe to eat after that but not the best quality). To eat, let them thaw overnight in the fridge or microwave for 2-3 minutes (exact timing will depend on your microwave and quantity). You can also freeze the meatballs raw without the sauce. Freeze them arranged on a baking sheet for a couple hours and then place in airtight containers (this will prevent them sticking together). When ready to cook them, let them thaw overnight in the fridge and then proceed as written in the recipe. You can also bake them raw, but you will need to add about 15 minutes of baking time. UPDATE NOTE: This post was originally published on February 4, 2013 and republished in September 2018 with a new recipe, new photos and more tips. These look delicious! I love the Asian flavor. Have you ever tried freezing these meatballs? I’ve never frozen those meatballs, they disappeared before they had time to reach the freezer haha. But I don’t see why it wouldn’t work. I would cook the meatballs without making the glaze, freeze them and make the glaze only when you’re ready to eat them. Mmmm. 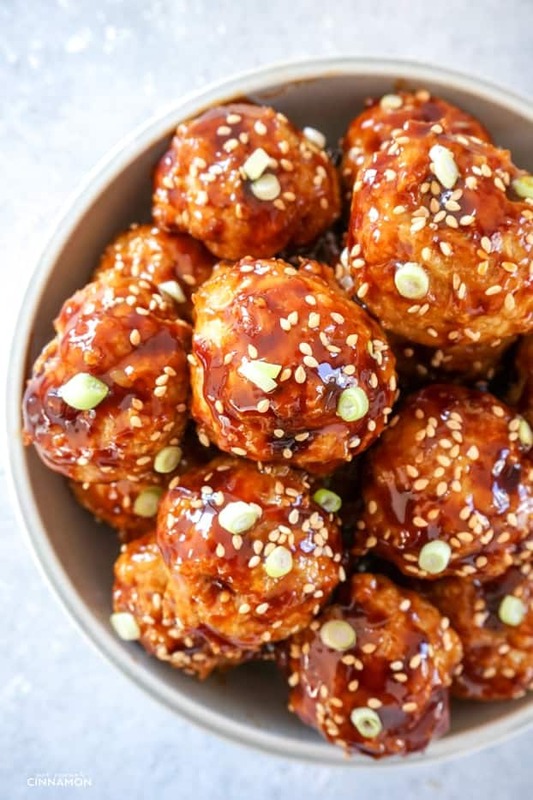 I love all things Asian and meatballs. I’ve never even thought to put the two together! I think these with some kind of spicy peanut noodles and a veggie dish would be a full meal! I love the idea of spicy peanut noodles with them. And some stir-fry veggies! yum! I’m with you on this one! Sorry it’s a typo, I meant “Wine” and not “Vine”. I updated the recipe! these look delicious! love that you can freeze them too! Such a great recipe for a meal prep! Although I don’t eat meat myself but I’m sure my family would absolutely love them! 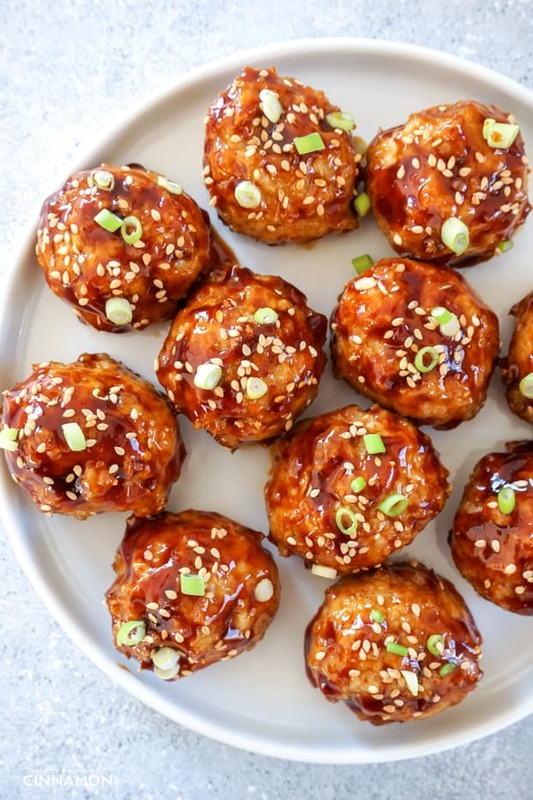 This chicken meatball recipe looks easy to make and lower in fat than traditional. Love the addition on sriracha for a little kick. Delish! These sound so delicious, love the sound of that glaze! These look AMAZING! I love a spicy meatball, and thanks for the tip for using an ice cream scoop. 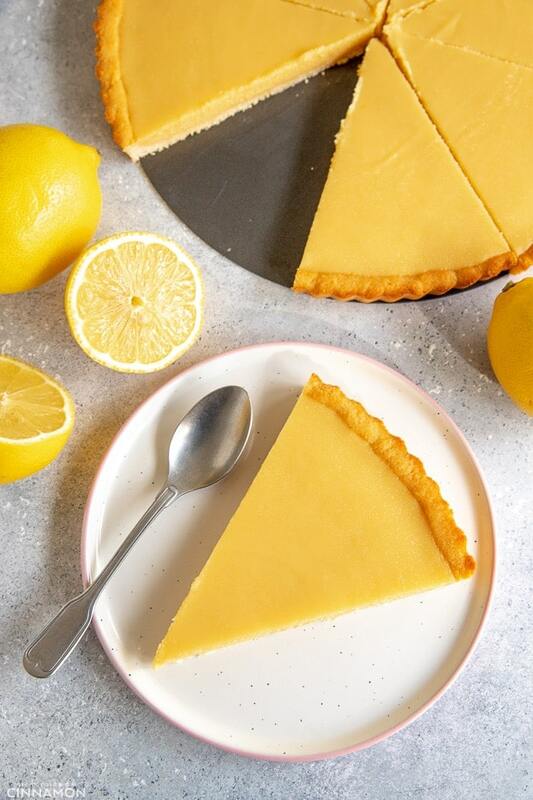 My family and I LOVE this recipe! Thanks! Looks so good. I can’t wait to make these! 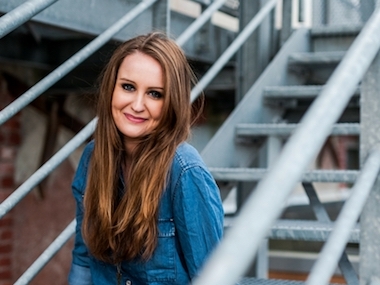 Thanks so much Karly, it’s one of my fav recipe recently! I made these last night and they were so tasty! And a quick meal to make too – bonus on weeknights. 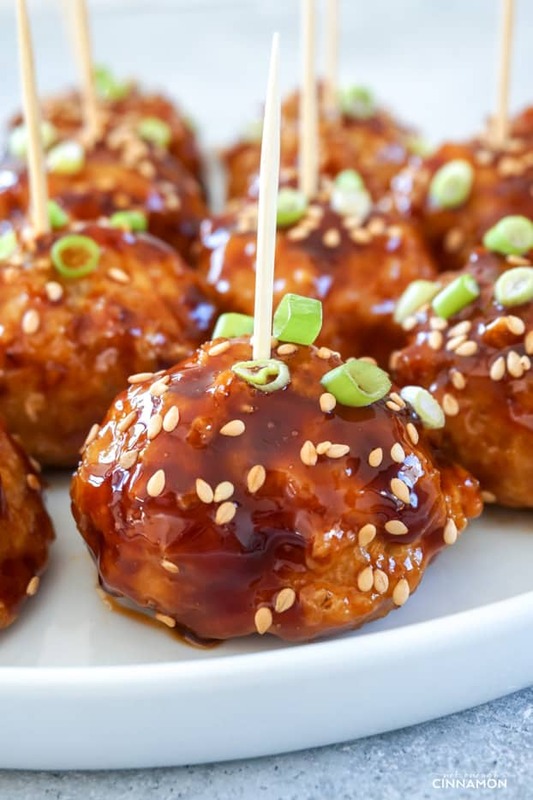 The Asian Glazed Meatballs are packed with flavor and would make a delicious addition to your Super Bowl line-up.I love eating chickens,its one of my favourite dish. Thanks Alexandra! Seriously, they’re one of my fav meatballs ever!